Easy to store, transport, and install, the JXi pool and spa heater is 38% lighter with a 28% smaller footprint. 180° rotatable top so you never need to rotate headers. Electrical panel flips up for ease of service. 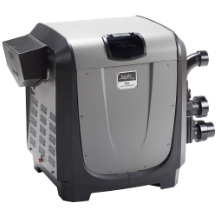 3-port header for easy plumbing and drop-in replacement of MasterTemp, Max-E-Therm, and Jandy Pro Series pool heaters. Provides versatility and ease of installation. Digital interface for effortless temperature control and diagnostics with run-time and cycle meter. ***Versus a similar system without VersaFlo.